A new body of work by Emma Elliott is featured in a sculpture biennial at Asthall Manor in the Cotswolds, UK. The exhibition is accompanied by the launch of a new video work on Sedition. The UK’s only exhibition dedicated to stone work, the on form 18 sculpture biennial, runs from 10 June to 8 July in the town of Burford. on form 18 was founded in 2002 and is currently in its ninth edition. The exhibition features the work of forty sculptors including Helaine Blumenfeld OBE, Peter Randall-Page RA and Rise Art Award winner Tom Waugh. Elliott was awarded an on form bursary, which supports young sculptors who work in stone. She is only the second artist to have received the bursary. Elliot’s work in the exhibition, Transient Global Amnesia, is a response to the impact of human behaviour on the natural world. It comprises four sculptures in Carrara marble: High and Dry, The Scream, Wry?No! And Elephantom. The impermanence and fragility of nature and its relationship to human action are central aspects of Elliott’s work: with Transient Global Amnesia she reflects on the increasing number of species threatened with extinction. 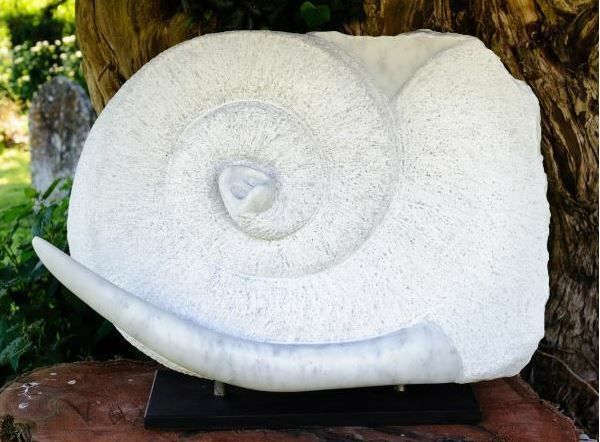 The four sculptures in Transient Global Amnesia are made from marble sourced in Tuscany where Elliott carved the pieces. Also on display at on form 18 are works from Elliott’s earlier series Reconciliation, which looks at the perpetual extremes and contradictions of human behavior by making a visual link between the stigmata of Christ and the number on the arm of a concentration camp prisoner. Reconciliation is on display at St Nicholas Church, next to Asthall Manor. Alongside the sculptures, Elliott is launching a video, Elephantom, on Sedition. The video shows the process by which Elliott carved the sculpture of the same name, which belongs to the Transient Global Amnesia series. The footage is accompanied by a soundtrack by composer Caspar Leopard.